There are many key elements to making a great barn in the Northern California foothills. One of them is the wash rack. 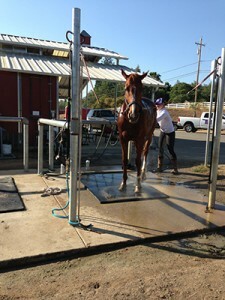 A wash rack is a place to rinse off or give your horse a bath. There are many wash racks in the horse world. A wash rack can be just a post and a slab of concrete and a hose. But that is very elemental. There are several things that go into a great wash rack. The absolute main thing about wash racks is the location. Where it is placed is a big key aspect in gold country horse properties. The wash rack should not be placed by a high traffic area because there is a lot of water and it can create mud. Also you don’t want it on a hill; the horses could slip and could fall if it were very slanted. If the wash rack is at a barn where people board horses, it would be best if it wasn’t placed near the parking lot, because stray jets of water can hit the cars. A vacant stall can be converted to a wash rack. Or it can be placed outside of the barn. Some benefits of it being in a stall are that you can wash them even if it is raining. When the horse is in the wash rack that was an old stall, the horse feels safer than if it were out in the open. The back if the stall can be the back board for the horse. In every wash rack there needs to be proper drainage. You never want your horse to be standing in water. The flooring is probably the most important thing in the wash rack. Just plan dirt can get very muddy and slippery. Concrete works very well. It drains and it won’t get dirt on the horse and it isn’t too slippery. But in the off chance that the horse does slip and fall concrete is very hard and can be ruff. Rubber mats offer more cushion, and they still drain and can be cleaned easily. Rubber mats can help with cracking in the concrete, and they are quite durable. All wash racks have to have some where to tie your horse. A hitching rail is one way. But I find that the most popular is cross ties. These keep your horse safe and secure. One thing that most people like is a bar that goes behind the horse so that if they were to pull back they would hit that instead of pulling back just on the cross ties. The next major thing that goes into a great wash rack is the water. A common hose can and will do the job. But if it has the option to be heated, then that will be a great asset. Heated water helps if you need to run hot water on something on the horse. You can wash the horse all times of the year if the water can be heated. Hoses can trip and spook the horse. If it were hung from the ceiling of the wash rack that is in the barn, then it would be off the ground. That way it wouldn’t trip the horse. And the last thing that is helpful, but not necessary, is a place to hold shampoo, brushes, and drying tools. A small shelf or basket hung on a wall or near the wash rack is very useful. Wash racks are part of a quality northern California foothill horse property. Understanding the elements of a horse wash rack can add value to your horse property. I read your blog that is very nice.